To the north of Chequers Lane at Preston, a mansion, Hunsdon House, was built near the site of Preston Castle. Nearby was a well which was 270 feet deep . Hunsdon House fell into disrepair in the early nineteenth century and was a ruin by the 1850s. Nearby, a stable was converted into a farmhouse – but this was destroyed by fire in 1868. 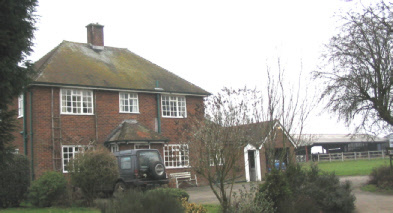 Castle Farm, as it is known today, was then built and a lodge was added in the twentieth century. 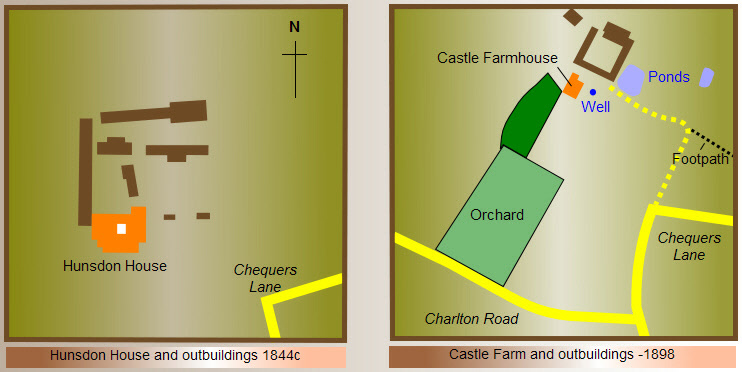 The area of farmland (which is both arable and pasture) associated with Hunsdon House and Castle Farm was remarkably unchanged between 1861 and 1945 at about 278 acres. 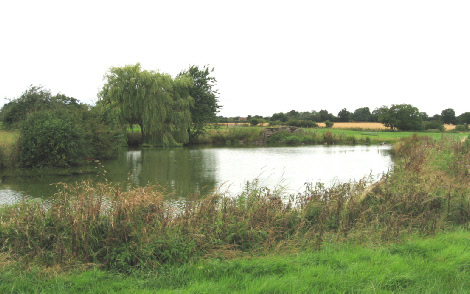 It included a chalk pit and a pond to the north of the farm that was large enough to provide water when the fire brigade attempted to save the house and buildings in 1868. 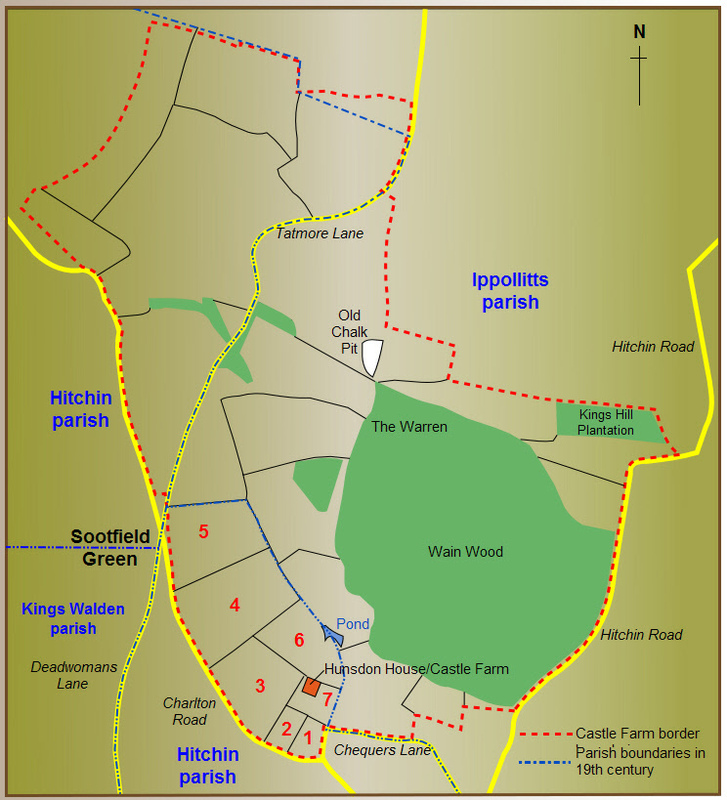 The land was divided by the parish boundaries of Hitchin and Ippollitts and fell within the manors of Temple Dinsley and Maidencroft. The farmland bordered Wain Wood which was owned in the nineteenth century by the Radcliffe family. In 1945, when Castle Farm was sold, the 95 acres of Wain Wood was included as part of the package. The approach, past a neat entrance lodge, was by a gravelled road through a meadow. There were four bedrooms and a large bedroom for servants on the upper floor of the mansion. On the first floor were three spacious apartments opening into a gallery, dressing room, water closet, three other bedrooms, apple room and staircases. The ground floor had a drawing room (30’ x 20’), a dining room (20’ x 18’), a billiard room, kitchen, pantry, servants’ hall, wash-house and dairy. There were also wine and beer cellars. The outbuildings included a double coach house, five-stall stable over which was a granary and a loft, a coal house and wood barn. There was a 23-feet long greenhouse adjoining the breakfast room, a 20-feet long grapery and a mushroom house. The grounds occupied four and a half acres,(including the Wilderness) which were thickly studded with lofty firs, chestnut and lime trees. There was a well planted orchard and garden and walks ornamented with evergreens, American and other flowering shrubs. In 1873, the daughter of William Curling wrote these poignant observations about Hunsdon House: ‘This old country-house was then unoccupied, and standing, forsaken and dilapidated, in the midst of its still beautiful gardens. A narrow lane, running south from Preston, led you to a simple lodge. You then passed through meadows, well fenced with haw­thorn and holly, to the north front of the house. Over a low, strong hedge of sweetbrier, you saw a massive grey porch, a little overhung with virginia creeper; venerable casements looking out on the broad carriage-road which led to the hall-door, and a circle of flower-beds with a central sun-dial. Wide walks, fair lawns, huge evergreens, each one a kingdom of leaves, met the eye as you entered the gates. Well do I remember those grounds, and the wood of pines and chestnuts at the end of them! In the gardens, one saw everywhere a happy blending of modern art with the dear, old, stately formality of other days. But the house had suffered loss at the bands of some indi­vidual who had preferred convenience to the charms of antiquity ; and had been still more injured by another, who had given a castellated front to a pile half manorial, half Georgian. Preston Castle, when I remember it, stood silent and forsaken, a fit haunt for the ghosts of my childish imagination. The ancient hall and many chambers centuries old, were on the north side; on the south were the Georgian rooms. Even there, one's footsteps echoed strangely, and the mid-day sun, passing into them through an outer blind of sweet roses, starry jasmine, and climb­ing creepers, could not lighten the gloom within. The sight of the mil­dewed walls, the faded, falling papers, the blank, deserted hearth, would have saddened any heart but that of a child, full of "life, and whim, and gaiete de coeur"’.The full text of Miss Curling’s article in Gentleman’s Magazine can be found here: Hunsdon House. 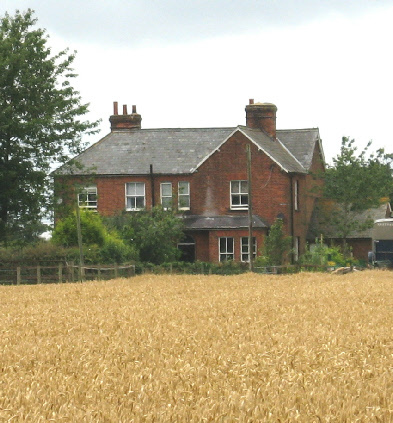 The farmhouse of Castle Farm was converted from stables. The 1837 Rates Book and 1841 census show John Wright (born 1761c) occupying Castle Farm. John’s son, Samuel died there in 1839. John died of debility on 11 December 1841 (the informant was Mary Jeeves; he left legacies of more than £1,750) and his son, George Wright, briefly took over the tenancy but between 1845 and 1851 George moved to farm at Preston Hill. By 1851 Samuel and Dorothy Kirkby were at Castle Farm. Samuel was appropriately born at Hunsdon, Herts in 1807. He and Dorothy had seven children of whom one, Emma, married Frederick Armstrong of Preston Hill Farm (Link: Armstrong). In 1861, Samuel was employing eight men and five boys at Castle Farm. In 1862, one of his labourers, John Fitzjohn of Sootfield Green, left Samuel’s employ ‘without cause’ thinking that he could earn more elsewhere. Another worker, John Sharp was labouring at Castle Farm, when Samuel’s son, James, asked him why he wasn’t at work one day. Sharp responded by hitting James and his horse with a stick. Although Samuel Kirkby was still at Castle farm at the end of 1868 (William Pedder stole nine turnips from him in December) perhaps the trauma of the fire and the effort of rebuilding the farm was too much for him – he was 61 years old. Samuel gave up the farm and moved to another farm at Eastwick, Herts. In 1871, Castle Farm had a new tenant - Stephen Marriott. John Dew was born in Cambridgeshire circa 1824 and occupied Castle Farm from approximately 1884 to 1905. He was also a surveyor of highways around Preston. There was ill feeling between Dew and Preston hay dealer, Frank Brown. Brown was charged with throwing a missile at Dew when Dew was driving towards Hitchin in 1891 and then threatened to assault him. The following year, after Dew brought a charge of obstruction against Brown for leaving a dog cart on the road, Brown threatened to ‘do for him’ and stated that Dew had ‘given him a great deal of annoyance’. Note: Wain Wood and land surrounding it to the south-east, east (sandwiched between the wood and the Hitchin Road) and to the north was owned by the Radcliffe family and was sold to James Barrington White of Temple Dinsley in 1902. ‘Some years have elapsed since any fires have occurred in the neighbourhood of Hitchin so destructive as those we now have to record. The first was at Preston Castle Farm, about three miles from Hitchin, belonging to Mrs William Curling and in the occupation of Mr Kirkby. The farm is about 300 acres in extent and a larger proportion than usual had this year been sown with wheat. There were also some fair crops of oats and barley, besides hay, both old and new. The whole of the year’s produce was garnered in barns and stacks near the house, which, with outbuildings, formed a kind of oblong square, enclosing the fold and rick yards. The house itself faced towards Hitchin and was a long, low range of a brick building, with a well house and lumber room at the upper extremity, nearest the village of Preston; the lower extremity joined on to the stabling etc., being connected with the outer range by a small thatched wood-house. The mansion known as The Castle was pulled down some twenty years ago and the farmhouse just destroyed was converted from the stabling of the old house. The old place was historically interesting as being the supposed scene of Sterne’s Tristram Shandy; and it is almost certain that the chief characters in that racy work, including Uncle Toby and Corporal Trim, were delineated from local celebrities with whom the author became acquainted during his periodical visits to the Whittingham’s, the Hinde’s, and other local families then residing in the neighbourhood. The fire was discovered shortly before eight o’clock on Saturday morning by one of the men working on the farm. He called the attention of Mr Kirkby’s son to some smoke issuing from the long barn or granary standing in front of the house and which was filled half with wheat and half with barley. An alarm was immediately given and of course the family and all about the place were thrown into a state of excited consternation. But a few minutes elapsed before Mr Kirkby had mounted a horse, galloped to Hitchin, given the alarm of the fire and called out our local fire brigade. They received intimation of the fire about a quarter after eight and by the time that four horses had been attached to the largest of the engines, the following firemen were equipped and ready to start: Messrs. F Latchmore, F Shillitoe, E Logsdon, G Pack, J G North, J Throssell and W Hill. They made all possible speed to the fire and arrived by nine o’clock. 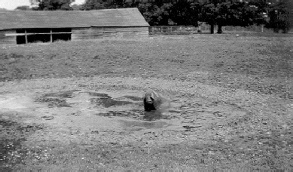 A pond near the house was dried by the late drought and had just been cleared out and the only water available for the use of the engine was derived from a broad, shallow pond (shown below) about 500 yards away from the farmhouse. There was plenty of hose, however, and the firemen, assisted by willing labourers, did all they could to check the flames; but that all was not of much avail. By the time the fire engine arrived, the greater portion of the damage was done and the flames had got complete mastery over the whole area. A light shifting wind blew all the morning, driving flames and burning sparks hither and thither from point to point of the property. From the granary in which the fire began, it crept to another and so from stack to rick, from rick to barn, until it made its circuit round to the stabling and having seized on the thatched wood house already referred to, got hold of the dwelling house, which was quickly wrapped in a sheet of fire. So intense was the glare that even in the brightness of the morning sun, the forks of flame showed lurid red high in the air and attracted spectators from places far distant. It would seem to a visitor who came to the spot after the worse was over that much could have been saved if the efforts had been made to circumscribe the limits of the fire by pulling down some of the connecting links; but it is more easy to be wise after the event than to do exactly the right thing at exactly the right moment. What those on the spot did in the first panic of excitement was quite right and proper to be done. They got out the horses and other living creatures as far as they could from the fiery circle which so rapidly surrounded them and carried out the greater part of the household furniture and personal property from the house before the fire laid firm hold upon it. Some bedsteads and other cumbrous fixtures that could not be hastily removed were left to their fate but most of the moveables were saved. The poultry flew into the neighbouring wood and kept up a distressful noise all day at being driven from their usual haunts. Not all the stock was saved for the half-burnt carcasses of two large fat calves and two young pigs were found among the ruins of the farmyard. It is said that the men about the place cut the flesh from the bones of these animals and ate it half-charred and half raw as it was: for certain, the meat had been stripped from the carcasses and nothing was left but red bones and entrails in the afternoon.So great was the heat that the fruit on the adjacent apple trees was baked as it stood and this too was eagerly devoured when the fire subsided. It was late in the afternoon before the fire had spent its fury. The farmhouse, the barns, the corn stacks, hay ricks, implement shed, stables and all were reduced to a heap of smouldering ruins, emitting fitful flashes of flame as the wind puffed round the embers. The upper end of the homestead, consisting of the well house before-mentioned had been saved, for the firemen had mounted the tiles and with their axes cut away the roof of the building so as to break the further spread of the fire. Also, they managed by dint of great exertion to save one large wheat stack at the more distant extremity of the yard, but this, although rescued from destruction, was damaged by water and smoke. A very large quantity of valuable hay was destroyed including two ricks of old hay and the produce of this year’s crop. Besides the wheat, barley and oats there were two ricks of oats and some dressed vetches. It was pitiful to see the grain, left unconsumed by the fire, trampled underfoot in all directions. The hay-stacks smouldered obdurately in dangerous proximity to the wheat stack that was saved and the firemen played upon the burning mass until the pond was pumped dry and nothing but thick mud remained. Then the engine limbered up and brought back to Hitchin on Saturday night. Between 20 and 30 men – mostly labourers - worked the engine during the day, some of them standing up to their knees in water for hours. The unobtrusive heroism of a young married labourer named John Jenkins deserves special attention. His task was to raise water by means of a windlass from the well at the end of the house, said to be 270 feet deep: he worked away at his arduous task for several hours with uninterrupted energy until at length he fell back senseless. He was laid down on the grass outside until medical aid arrived from Hitchin: then it was discovered that his heart was suddenly affected by excitement and unwonted exertion and he was carried home. For some hours his life trembled in the balance; but we are glad to hear that a favourable reaction set in on Sunday and that he is now recovered. The numerous family of Mr Kirkby was thrown into great fright and commotion, as may be supposed; but they all found temporary refuge under the hospitable roofs of neighbours and friends. The new tenant farmer at Castle Farm in 1871 was Stephen Marriott. Born in around 1824 at Milton, Northants, Stephen had been farming at Toddington, Beds before his move into Hertfordshire. Among the news stories mentioning Stephen was a charge of killing three pheasants out of season in 1876. He claimed that he thought they were smaller partridges and escaped a fine. Among his labourers in 1876 was George Hawkins of Hitchin. It seems from the court case in which Hawkins was accused of theft that Stephen settled his labourers wages in The Chequers public house. In 1879, Stephen grew a crop of beans. Stephen died in the winter of 1883. His widow, Emma, moved to Rose Cottage, Chequers Lane and died in early March 1908. On Monday morning at 9.30 a fire broke out at Preston which resulted in the destruction of the picturesque lodge, tenanted by Mr. J. G. Dew, and standing in the field at the entrance to the Castle farm, which is owned by Captain Curling and in the occupation of Mr. John Dew. The old cottage had something of an ecclesiastical appearance. Built of brickwork covered with cement, the little building was remarkable for its Gothic windows with their diamond shamed lead lights, while one end of the house had, as it were, a great Gothic moulding as if at some distant time a large window had existed there. Moreover, on the plaster, covering the brickwork within the moulding there appeared a rough representation in black paint of a diamond-paned window. Surmounted by a thickly-thatched roof, the old building had always excited comment, and another local landmark has now been added to the long list of those destroyed by fire. 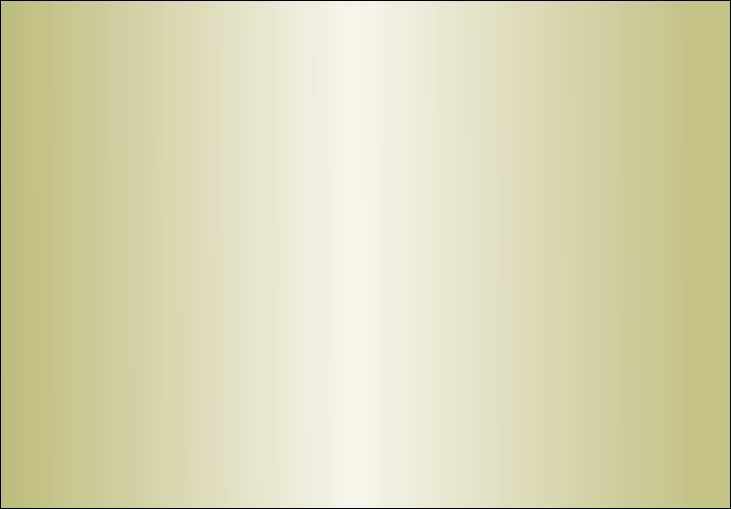 The fire, it is thought, originated from a spark from the chimney falling upon the thatched roof. Mrs. Dow was upstairs at, the time and as the thatch burst into flames she at once alarmed the villagers, who gave ready assistance in removing furniture from the rooms beneath. The Hitchin Fire Brigade were telegraphed for and it is worthy of note that, despite the distance of the fire station from the Sun stables, from which the horses are supplied, the steam fire engine and the hose reel were on the way to the fire exactly eleven minutes 'after the receipt of the telegraphic call. The brigade were under the command of Captain Logsdon, Lieutenant L. C. Barham, who happened to be in the neighbourhood, joining the firemen at the scene of the fire. Upon arrival at Preston at 10.30 it was seen that there was no hope of saving the burning building, which now resembled a .great, furnace. Attention was turned to the thatched houses 'war by and after one roofs had been well wetted further danger of' their catching fire from falling sparks, was obviated. At 12 30 p.m. the tire had practically burnt itself out, only a portion of the walls and a chimney stack remaining. The brigade thereupon returned to Hitchin, having made the further spread of the fire an impossibility. The property destroyed included the house and several barns, with a considerable portion of their contents. It is understood that the loss is fully covered by insurance. The farm, together with Wain Wood and its surrounding fields, was sold to the Pilkington Estate in 1945. Today, it is home to the Prescas herd of pedigree Holstein Fresian cows. In the 1660s, Hunsdon House at Preston was home to the Foster brothers – six of them (three married, three bachelors) lived there. The owner of the mansion was John Foster and he and his family farmed the land which is today known as Castle Farm. They were ‘intimate friends and enthusiastic followers’ of John Bunyan, offering the preacher a welcome and shelter in their home during troublesome times. They were ‘steadfast and true men’, ‘distributing to the necessity of saints, given to hospitality’. More than once, because of their knowledge of the lie of the land, they were able to spirit Bunyan away from the troops searching for the dissident who surrounded Wain Wood. On one occasion, ‘Bunyan was sitting with the Foster Brothers in their house at Preston when someone asked him to explain a biblical verse....(he replied) “all that I can say in answer to that question is that the Scripture is wiser than I”’. When the Great Plague swept through London in 1665, some fled to Hitchin carrying the deadly disease. In one month alone, more than thirty died of the plague. During the panic that ensued, the Baptist followers of Bunyan were almost the only ones who risked their lives to minister to the sick. Included among them were the Fosters, whose disregard for their own well-being won the admiration of their opponents. It is told that during a time of Bunyan’s imprisonment, when a sympathetic jailer allowed him leave of absence in advance, he was met by one of the Foster brothers with two horses and a farm labourer was left behind in his stead while Bunyan rode away to preach to his flock. Later, Bunyan arranged for his second-in-command, John Wilson, to minister to his followers in the area around Hitchin. After his trial in 1677 there was a church meeting at Brother John Foster’s home. When, Wilson was incarcerated in Hertford Gaol, more than fifteen miles away, each week one or more of the devoted Fosters travelled from Hunsdon House to Hertford with a ‘basketful of fresh country-fare’ to sustain him. The Fosters were among the founder members of the Baptist Meeting House built at Hitchin in 1692. When Wilson was succeeded by John Needham in 1705, Needham was met in the vestry of the chapel by Edward Foster and told, ‘And need enough we have of you’. Several Fosters and their descendants served the Hitchin Baptist Church for three hundred years – when the new church was built at Tilehouse Street at Hitchin in 1844, among the speakers at its inauguration was John Foster, then of Biggleswade. When Bunyan’s Chapel was built at Preston in 1877, the two foundation stones were laid by Edward and Ebenezer Foster, descendents of the Hunsdon House family. The foregoing may not tell much of Hunsdon House and Castle Farm but it does inform us about the character and beliefs of its owners and a frequent visitor almost three hundred and fifty years ago. After his army career, Robert applied himself to farming – yet his military training asserted itself even in this pursuit. When he summoned and dismissed his labourers, it was proclaimed by a chorus from his Light-Horse bugle. However, he took his farming seriously – ‘I pursue the following method: wheat after the fallow, then peas, turnips, barley, oats, clover, wheat’. He suggested improvements to Arthur Young’s swing-plough and trialled the Hertfordshire great-wheel plough and the one-handle Essex plough. When Robert Hinde (3rd) died in 1786, the house and land was passed around his sons, John, Samuel and Peter until it was sold to the beast salesman, James Earl in June 1815. Five months later the bankrupted Earl sold the property to William Mellish. He allowed the house to quickly deteriorate and five years later Mellish sold his holding to a group comprising: Revd. George Millett, Thomas Flower Ellis, John Hayton and William Davies. In 1820, the consortium sold the mansion and land to William Curling (1st) and it remained in his family for more than a century being passed down to William’s son, William Curling (2nd) (1842), William’s (2nd) wife, Flora Jones Curling (1865) who sold the property to her son, Major Edward Spencer Curling (1904). Major Curling purchased the freehold to the property in 1919. The estate was sold in 1945 and is now part of the Pilkington estate.